As a full time CIO, I love data. 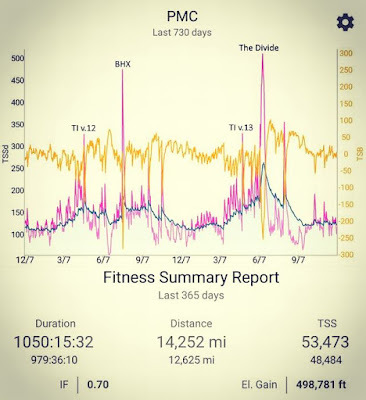 And TrainingPeaks delivers. I can plan and crunch numbers to my heart’s content. It allows me to self-coach. I also believe in working hard but you must also play hard! My bikes allow me to play all year long. I will use them to inspire me! 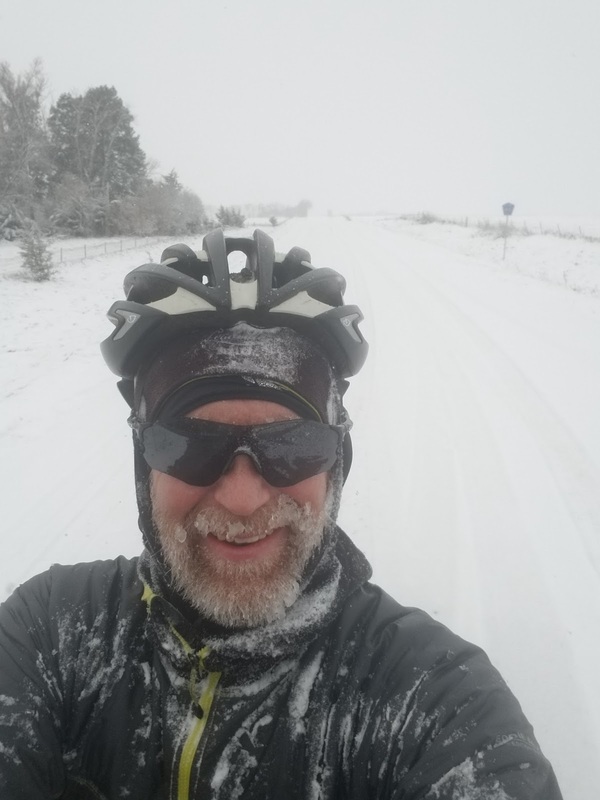 Winter Ultra Adventure – What do I bring to stay safe on a multiple day winter ride? 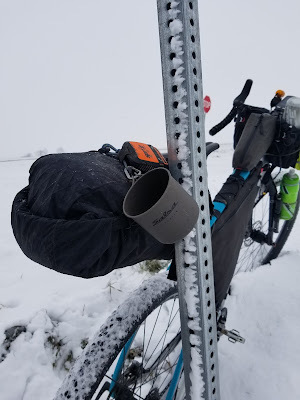 This last weekend I planned a little winter biking adventure so I thought I would share what I took with me to stay safe and cozy warm. Needed to attend a wedding with my wife in Moorhead, MN. My wife needed to take the car to Minneapolis for work and I did not want to drive two cars to Fargo/Moorhead. So, I planned a small winter adventure to get myself home. 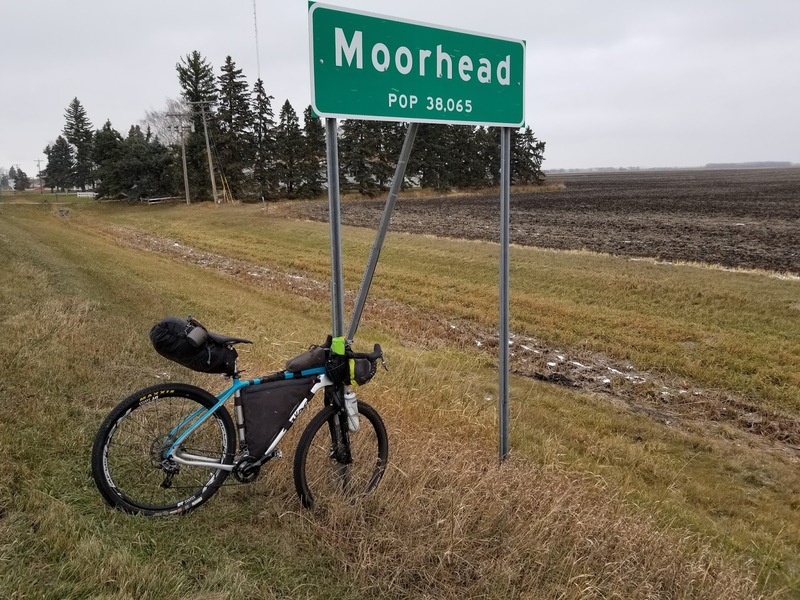 Ride 260 miles south from Fargo/Moorhead to Sioux Falls, SD in winter conditions. Always important to understand the weather forecast when planning for winter ride. Most importantly remember weather professionals never get it right so your plan needs to adaptable to all winter weather conditions. o Snow forecasted over night over northern portion of route. o Mid 20’s with 15-20 mph, NW winds with a zero degree wind chill. o Up to 5 inches, snow fell in mid part of route and freezing drizzle fell northern region. o Mid route, the roads were snow packed and icy. o Overnight the forecast changed. 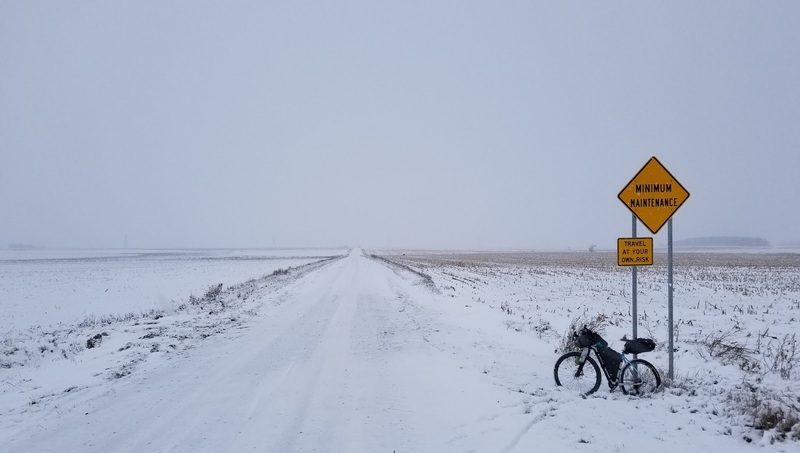 4-6 additional inches of snow fell over the night from Sioux Falls north to where I was to begin my ride. o Snow was to continue throughout the day. The forecast changed drastically from what I was originally planning to deal with so I had to be mentally ready to adapt as I moved south into the wintery adventure. This is what works for me after years of testing so please experiment to get your gear figured out. I use this gear if it is between 10 – 30 degrees outside. I use my jacket zipper to regulate core temperatures to prevent sweating. Moisture during winter riding can act as a thermal transfer to your body and have a negative effect so it is important to control. · Head – Helmet, Oakley Sunglasses, Ear Warmer, Wool Buff, and Thermal Skull Cap. · Hands – Mid grade wool gloves with an Outdoor Research mitten over. I like this combo because I can easily curl my fingers to keep warm. · Feet – Point 6 expedition socks, normal mtb shoe with 3mm waterproof shoe cover. · Core - Pearle Izumi Thermal Long Sleeve Base layer, jersey, thick wool jersey with an Eddie Bauer First Ascent permaloft jacket. Jacket is quick to dry and very breathable so great for moisture control. · Legs - A combo bibs with Pearl Izumi Elite Thermal Bike Tights over. 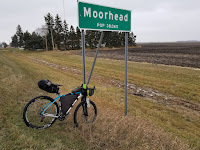 I packed this gear just in case the South Dakota winter weather took a nasty turn for the worse or if I had a significant breakdown, I would layer up to stay safe. · Seat bag - Mountain Hardwear Ghost Whisperer Hooded Down Jacket, Smartwool Base Layer Hoody, Pom Beanie Stocking Hat, Vapor barrier socks and gloves, light and heavy wool socks for layering with vapor barrier socks, cook stove with coffee and ramen noodles to cook in a pinch warming the inner core up quick. · Frame Bag – Several pairs of extra gloves, balaclava mask, tubes, and tools. 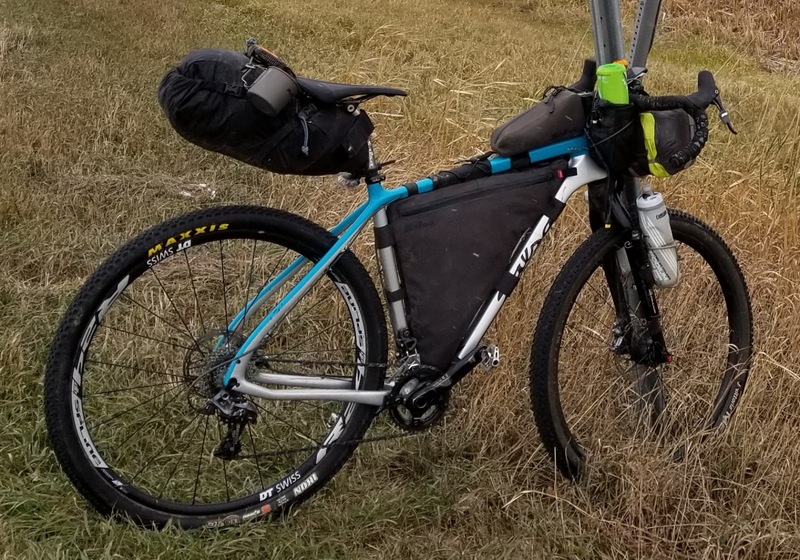 · Handle bar bag – 19 degree down sleeping bag, sleep pad, bivvy sack, and pillow. Temperature ranging from a minimum temperature of 17 to a high temperature of 29. 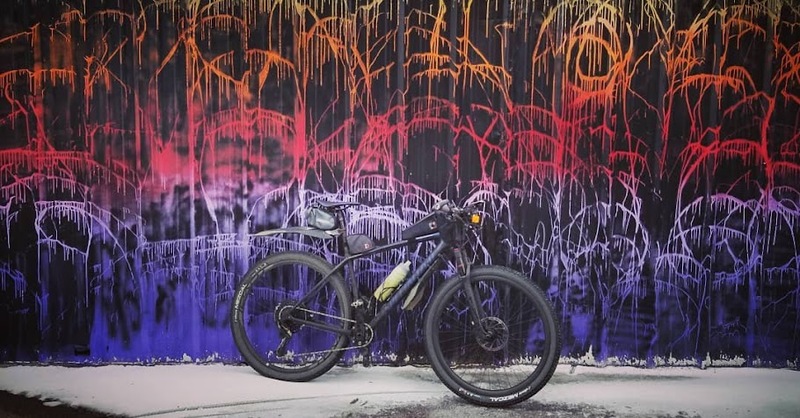 Ride went as planned the tail crosswind was cold on my right side but a nice push on my fully loaded Salsa Cutthroat. I stopped a couple times to refuel. 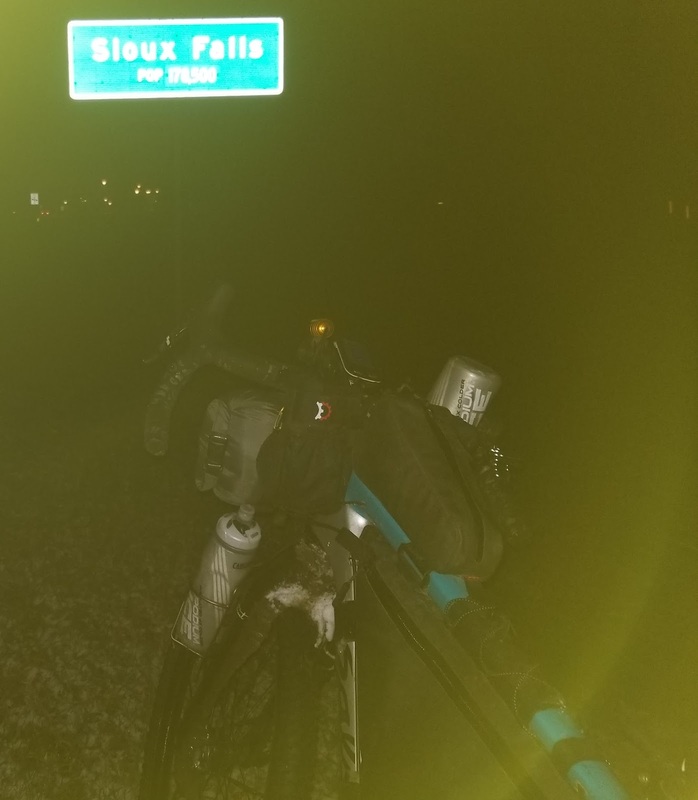 Each time I stopped, I was in and out very fast due to the zero degree wind chills. Once back on the bike I was cold for several minutes but warmed up very quickly. Total miles 125.6 with 7 hours ride time, average temperature 23 with zero degree wind chill. Day 2 was a day of adaptation. The forecast had completely changed for the worse. No sun, the wind was out of the south and several inches of snow had fallen making riding challenging at times. I had to deal with falling snow which when hits your body you start to chill easily. Ice is dangerous to ride on so my route was adjusted many times to avoid where possible. Slush was freezing my drive train to shifting was not working and any peddle pressure the chain was slipping over my gears. I limped my way for a couple of hours before hitting a town where I eat and filled my water bottles with hot water to keep my drive train unfrozen. As I was limping along, I hear a scream for HELP in the distance. As I approached, there was a woman that attempted to turn her vehicle around and got her car stuck in the ditch. She asked if I could help. All I was thinking was oh boy let the chill begin! Not safe for me at all. I sucked it up and saved that random woman in the ditch. 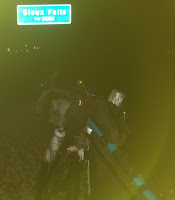 Yes, a bikepacker stopped in freezing temperatures and saves a damsel in distress...boom! 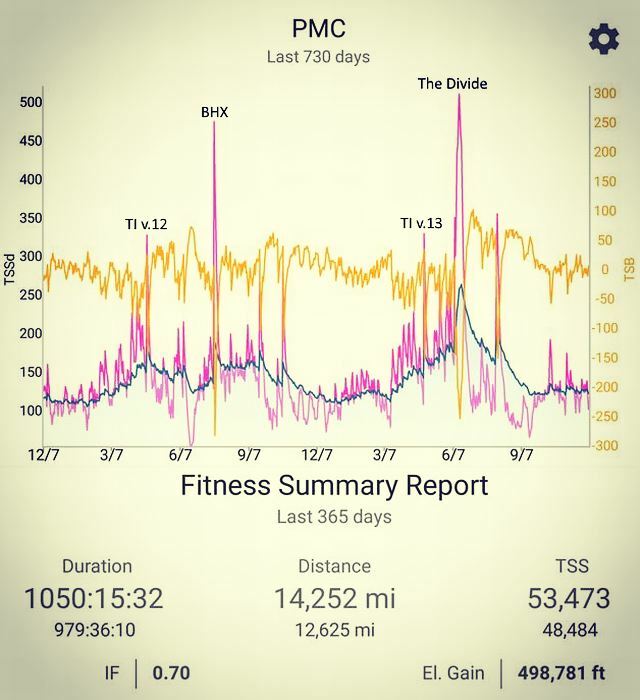 Total miles 133.3 miles 9:46 hours ride time, average temperature 25 with mid teen wind chills.